So, after a couple of months of searching, reading, listen a lot of 335 options and rejecting a good deal of real Gibson 335 RI (and really was hoping to be the one...), my final thought seems to be Greco SA 900. Greco SA 1200 it's much more expensive and I'm a little bit concern with the bigger neck. Now I can choose between the pre '80 SA900 and 81-82 SA 900. Any experience with these two series of SA 900? From pictures, SA 900 from 76-77 are with 3 pieces neck and top/back seems builded from 2 piece?! SA 900 from 81-82 are unreal copies of original 335, with one piece neck. Thanks in advance for any details and suggestions. No problem, yours was already on my list . post 79 are better ..
Well I've owned a '78 SA-900 now for some 9 years and will never part with it. I had a blonde SA-1200 (with Villagers help!) some years ago, but traded it for an EGF-1200 as I was/am happier with my £500 SA-900. Don't get me wrong, the SA-1200 was awesome (and one will come back to the house one day obviously...), but the '78 SA-900 has all the mojo / soul and tone I need from a semi. 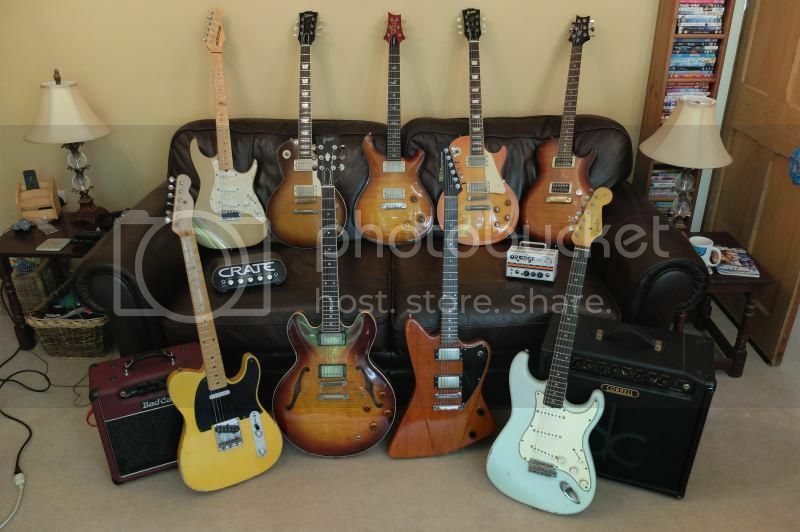 Gigs amazingly well too...fantastic stock pickups. It's had a stainless steel refret job from luthier Joe White here in SE England, and he said the fretboard is the finest Brazilian and other tonewoods and craftsmanship also from the top drawer. There you go...nestled into last years photoshoot! ...that's my Fret King Esprit V ...very very good guitar...superb playability, upper fret access and great PAF-alike pickups. That's a very cool guitar - kind of a play on Gibson's non reverse Firebird. Well, time for an update. 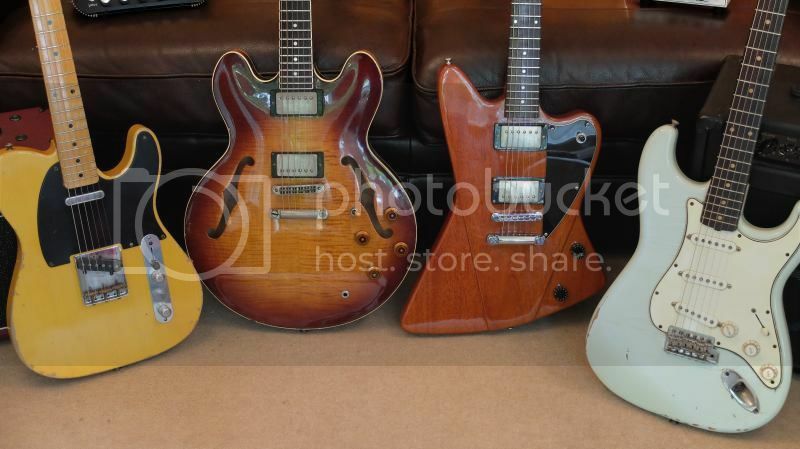 My search was ended (last year) by finding a 2011 Dot RI Gibson ES 335. Everything I wanted was there. And was the "real thing". The winter came and I saw a red Greco SA 900 on Reverb. I was unable to resist. Beyond my control. https://www.youtube.com/watch?v=cjUmvHBgHr0. Greco SA 900 brutally shook my happiness. Now I'm developing a Greco obsession and seems only the beginning.